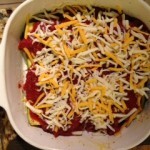 The other night, my hubby and I decided to experiment with a pasta-less lasagna. It was so good that we decided to make it again last night. 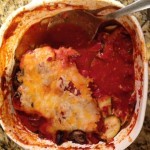 Here’s how we made a zucchini & mushroom lasagna. 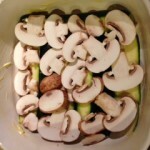 I have not yet experimented with adding other veggies to the recipe, but I will. 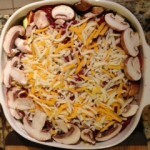 It was a yummy, repeatable recipe. 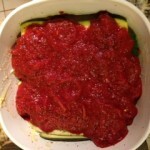 Rub the butter on the bottom of an 8″ x 8″ square pyrex baking dish. 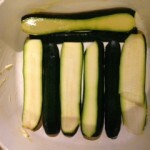 Repeat the layers as follows: zucchini. 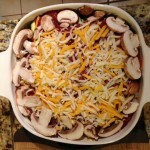 mushroom, spaghetti sauce, cheese – the last layer is the cheese layer (I added the remaining sliced mushrooms as garnish). Bake at 400 F for approximately 30 minutes (the temperature and baking time can vary.